The US will maintain an open-ended military presence in Syria to ensure the enduring defeat of the jihadist group Islamic State, counter Iranian influence, and help end the civil war. Secretary of State Rex Tillerson said President Donald Trump did not want to "make the same mistakes" that were made in 2011, when US forces left Iraq. The US has about 2,000 troops in Syria. Mr Tillerson denied the US was training a Kurdish-led border force, but Turkey accused it of sending mixed signals. "US officials have made statements that refute one another," said Turkish Prime Minister Binali Yildirim, whose country fiercely opposes such a move. "One day it was said that a new border force had been set up, another day they said they are setting up a unit with local forces in order to maintain security in the region after eliminating Daesh [Islamic State group, or IS] in the region. These are all confusing statements." 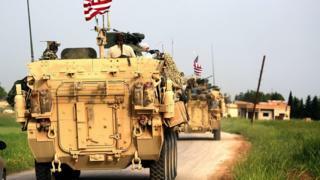 The US secretary of state said officials had "misspoke[n]" when they said the US was planning to set up a 30,000 strong "border security force" in northern Syria underpinned by the allied Kurdish-led Syrian Democratic Forces (SDF) militia. Mr Tillerson said the US was not creating a new force, but rather trying to ensure that local fighters were able to protect liberated areas from attacks by IS remnants. Turkey's president branded it a "terror army" and warned of imminent assaults on the Kurdish-controlled border areas of Afrin and Manbij. The Turkish army opened gaps in the border fence west of Afrin on Thursday, as the state-run Anadolu news agency reported that troops had been put on high alert. Why does the US want to stay in Syria? In a speech at Stanford University on Wednesday, Mr Tillerson said decisive action taken by President Trump had accelerated the progress made against IS. But he noted that IS was "not completely defeated" and that the government of President Bashar al-Assad - who the US opposes and has said should step down from power - controlled about half of Syria's territory and population. Mr Tillerson added that the US also faced "continued strategic threats" not just from IS and al-Qaeda, but also from Iran, a key ally of Mr Assad which he said had strengthened its presence by deploying troops and "importing proxy forces". He also said the unresolved plight of the millions of displaced Syrians remained a humanitarian crisis that only a political solution to the civil war could end. The Syrian government said the continued US military presence represented "a blatant breach of international law and an aggression against national sovereignty". What would make the US withdraw? Mr Tillerson said the Trump administration desired "five key end states for Syria". IS and al-Qaeda in Syria "suffer an enduring defeat, do not present a threat to the homeland, and do not resurface in a new form"
The conflict is resolved through a UN-led process, and "a stable, unified, independent Syria, under post-Assad leadership, is functioning as a state"
The Trump administration was implementing a new strategy to achieve those goals, which would largely entail increased diplomatic action, Mr Tillerson said. "But let us be clear: The United States will maintain a military presence in Syria focused on ensuring [IS] cannot re-emerge," he added. "We cannot make the same mistakes that were made in 2011 when a premature departure from Iraq allowed al-Qaeda in Iraq to survive and eventually morph into [IS]." He warned a US withdrawal would also allow al-Qaeda to expand its presence in north-western Syria; restore Mr Assad and "continue his brutal treatment against his own people"; and provide Iran with the opportunity to strengthen its position. How could the US help bring peace to Syria? Mr Tillerson promised to carry out "stabilisation initiatives" in areas "liberated" by the US-backed Syrian Democratic Forces (SDF), a force dominated by a Kurdish militia that Turkey considers a terrorist group. The initiatives would include clearing land mines, re-opening hospitals, restoring key services and getting children back to school. "We must be clear: 'stabilisation' is not a synonym for open-ended nation-building or a synonym for reconstruction. But it is essential," he added. The US will also seek to "de-escalate" the conflict by negotiating local ceasefires and vigorously support UN efforts to negotiate a political settlement. Mr Tillerson said the US believed free and transparent elections that included displaced people would "result in the permanent departure of Assad and his family from power". "This process will take time, and we urge patience," he added. The Assad government, with its Russian and Iranian backers, may have largely won the war but it does not control all of Syrian territory. An autonomous, largely Kurdish, zone has been established in the north with US-backing and now Washington is planning its next moves. The Trump administration is signalling that it intends to maintain a military presence in Syria. It wants to continue to support its Kurdish allies and to prevent the re-emergence of IS as a serious force. It is well aware that Russia is not vacating its bases in Syria any time soon. But US policy towards the region is now overwhelmingly focussed through a single lens - the effort to contain Iran. In the longer term though, keeping Syria divided and isolating the government may only serve to delay reconstruction and store up new problems for the future.